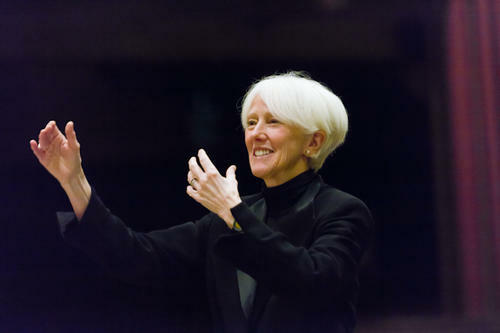 The Institute of Sacred Music announces the retirement of Professor Marguerite Brooks at the end of the 2019–2020 academic year. Prof. Brooks has had a long and celebrated career at Yale, leading both the program in choral conducting and the Yale Camerata since 1985. As founding conductor of the Yale Camerata, one of Yale’s first campus/city arts collaborations, Brooks has led nearly 200 musical performances featuring some of the most innovative and wide-ranging programming in the field. The Camerata and its associated chamber choir have performed music from the middle ages to the present day: The catalogue of composers ranges from Albinoni to Argento, from Palestrina to Pärt – along with Kernis, Lang, Lotti, Rheinberger, Respighi, Caroline Shaw, Reena Esmail, and so many more. For over thirty years, the Yale Camerata and Chamber Chorus have brought together students, faculty, and staff from virtually every department and school at Yale as well as hundreds of Connecticut residents to collaborate as part of the ensemble and with the Yale Glee Club, Yale Schola Cantorum, Yale Philharmonia, Yale Symphony Orchestra, Hartford Symphony Orchestra, Yale Concert Band, New Haven Chorale, and many other groups. They have been featured on NPR’s Performance Today, and on local Connecticut Public Radio. Brooks has long been a champion of new music, often emphasizing women composers. In 2020, a new major choral work by Pulitzer Prize winner Julia Wolfe celebrating the centenary of women’s suffrage in the United States will be premiered in New Haven. Brooks’s broad vision for music-making has been passed on to her students. In a recent survey, alumni often cited her as their primary reason for attending Yale and as the person who influenced them the most. Many of these graduates have occupied positions of musical leadership at major churches and cathedrals around the world, and in leading academic institutions. Among her students are the founding conductors of Grammy-nominated choirs Conspirare, Roomful of Teeth, and Seraphic Fire. Brooks has also been an active clinician, guest conductor, master-teacher, and jurist in North and South America, Europe, and Asia. The Connecticut chapter of the ACDA has honored her with its 2016 Lifetime Achievement Award. She was also honored recently as a Woman in History by the Barnard School, and in 2015 Dean Blocker awarded her the Cultural Leadership Citation from the School of Music for distinguished service to music. Jean and Yale School of Music dean Robert Blocker plan to work closely with their faculties to ensure the continued strength of these inspiring programs and to find significant ways to honor Brooks for her visionary leadership at Yale.